For more than 100 years, Brause Calligraphy Nibs have been considered by many calligraphers to be among the best on the market. Offering a subtle balance between relative elasticity for easier writing, and the resistance necessary for clear strokes, Brause Nibs are manufactured from cold rolled steel and pressed with tools specific to each model and nib size. The most delicate part of the manufacturing process involves cutting a slit down the middle of the nib, enabling the ink to flow correctly and freely from the reservoir to the tip of the nib. Brause offers a range of nibs for every style of writing. Extra Fine Point Nib — Also called "Arrow," this highly elastic nib has a high ink capacity and very smooth reaction. 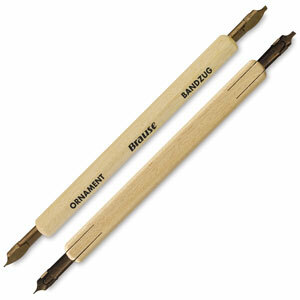 It's a favorite for pointed pen work. Steno Nib — Also called "Blue Pumpkin" because of its blue color and shape, this short hand nib has a very fine point and a very high ink capacity. It's also highly elastic. The Steno creates a thin line with perfect ink flow. Hatat Nib — Ideal for left-handed as well as right-handed users, the Hatat Nib is ideal for creating Hebrew and Arabic writing. Rose Nib — The Rose is a strong, super-flexible, fine point nib with an etched rose design. Hexagonal Nib Holder — This double-ended nib holder features a hexagonal shape for ease of holding. Natural Wood Nib Holder — This single-ended wood nib holder has a round shape and holds one nib. Three finishes; please allow us to choose. Ornament Nib — Used for titles, ornamentation, and monoline lettering, this round nib has a blade and an ink reservoir. Bandzug Nib — The Bandzug Nib is square for creating rounded writing (Roman, Italic, and Gothic), and features an ink reservoir at the top. Unique for the sharpness of its angles and the precision of its upstrokes, the Bandzug creates incomparable Gothic letters. Music Nib — The Music Nib creates a music staff but can also be used to write ornamental letters. The nib is 13 mm wide with 3.2 mm between each tine.